The seven-part Dark Judges miniseries is intended as a thank-you to fans who supported Dredd, but it remains to be seen how many direct ties the “unofficial” project will have to that film. Will Karl Urban slip the helmet back on as the taciturn Judge, or possibly Olivia Thirlby as the psychic Judge Anderson? We know Dredd screenwriter Alex Garland had big plans sketched out for the would-be franchise, so could he be involved as well? At the very least, we know Garland had specifically talked about wanting to bring the Dark Judges into the mix at some point as well. 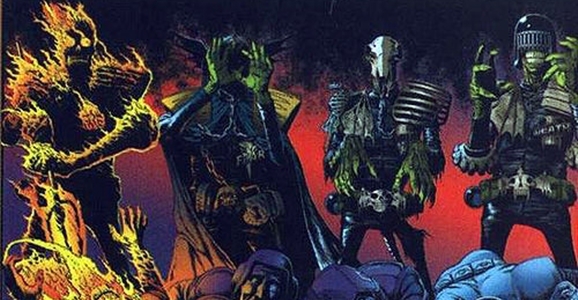 So who exactly are the Dark Judges? If you’re not familiar with Dredd’s comic-book source material, they’re a bit weirder than anything we saw in the movie. The foursome consists of Judges Death, Fire, Fear, and Mortis — undead “law enforcers” from a parallel dimension who decide the best way to prevent crime is to remove the source of crime. Unfortunately, that means wiping out humanity, proving that the Dark Judges are fans of neither babies nor bathwater. That’s the sort of scheme that would make Judge Dredd frown even more than usual, so presumably he’ll be involved in the web series somehow…and we’ll keep our fingers crossed that he looks a lot like Karl Urban. Shankar had actually hinted at the Dark Judges project during a Reddit AMA in March 2013, but at the time it was described as a single short film in the vein of Shankar’s Punisher: Dirty Laundry starring Thomas Jane and Ron Perlman. It’s great news to hear that it’s expanded into something more ambitious since then. At the very least, it gives Dredd fans something cool to look forward to. And who knows? Maybe it’ll help push an actual Dredd sequel that much closer to reality. You can watch Shankar’s Punisher short below, followed by the “thank you” video he posted to the fans last week.